Starting Your Own T-Shirt Shop: So you've got a great idea for a shirt? This is the first in a series of posts about how I started The Pi-Dye T-Shirt Shop. Hopefully, it will help you in starting your own t-shirt shop. About six years ago, an idea sparked in my head born partly out of an obsession with pi and partly out of a desire to create something that people like so much that they would be willing to pay for it. Yes, I had a great idea for a shirt. It would have the digits of pi on it in some cool fashion and would have the phrase "Approx imation Is For Wimps" at the bottom. It would be funny for a lot of reasons: 1. Just having so many digits of pi plastered on a shirt has intrinsic humor, b. It plays off of the fact that most math nerds are seen as wimps (or they definitely don't line up with the term "jock"), and 3) It's ironic because even the 3141 digits or so on the shirt will still be an approximation. So, we've all had this experience. Maybe yours wasn't charged with as much mathematical humor, but you have all said "That would make a funny shirt!" Some of you have, after thinking about it for a few more seconds, have also asked "Would people pay money for it, though?" 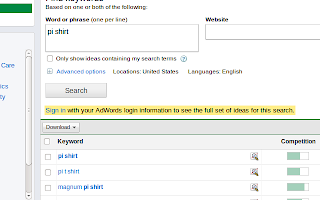 How many people are searching your shirt for it already? Nowadays, most people do their initial research on the Internet. I know that I almost never call someone on the phone/search for it at the library/go visit the store/etc. without trying to look it up online first. If people aren't searching for it online, then they aren't searching for it at all. So, on average, it yields 3600 searches a month. 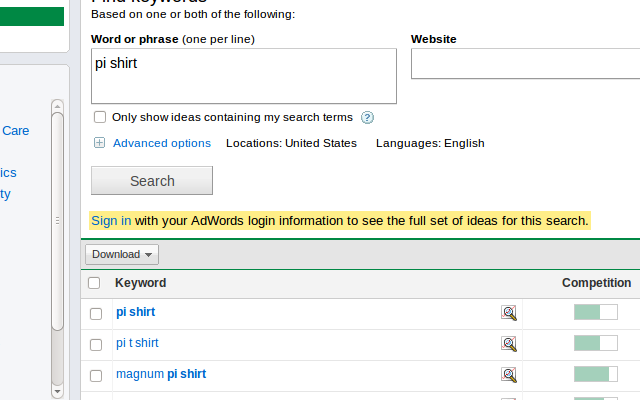 I can then click on the "pi shirt" keyword link, and it will take me to the search results for that phrase. Next, pay a visit to the three biggest t-shirt portals on the Internet: Cafepress, Zazzle, and Printfection. Type in the phrases that you found to be most relevant to what your idea is about and see how many products come up. Are there ones that are very similar to your own? Would your idea stand out amongst the crowd? Can you compete with the price that they are offering? How do I give the public what they want? Once you have ascertained how many people in the world are searching for your product each month, it's time to create your design. In another post, I'll talk about that in more detail. Today, I'll just simply give my official recommendation for Adobe Illustrator. There are a lot of graphic design products out there, including several free ones. If you really want to try this out, spend the $100 to get a used copy. You will get your return on it even if you don't ever create a shirt with it because it is simply so useful. This is really easy because they will handle the production and the fulfillment for you. All you do is use their online t-shirt creator tool and it will be made available to the thousands of people hitting their site each month. And it's free! In the past, I would use this route to try out a new t-shirt design, just to see if people would buy it. If I got enough sales, I would take it to the next level. Of course, good Internet marketing practices still apply here. You should still consider how you are going to get people to visit the portion of the t-shirt portal which contains your shirts. Things like SEO, Adwords, and blogging are a few among several strategies for doing that. If you have a bit more confidence in 1) your design and 2) your ability to please customers, then you might consider creating your own website, screen printing the shirts, and fulfilling the orders on your own. This is a huge step from the first level, but the difference in earning potential is also enormous. It will involve registering a domain, installing a shopping cart, adding your products, images, and descriptions, marketing your site, creating a mailing list, purchasing, tracking, and maintaining inventory, purchasing shipping supplies, and shipping out product. Phew! It will also involve talking to customers on the phone, dealing with returns, and so much more. A lot of these things can be outsourced or hired out, but I agree with Michael Gerber: You should do each of these things on your own first until you are able to systematize your efforts. After that, feel free to hire someone if you have the margins to do so. I have tried this with very limited success; however, I believe that it is mostly due to the niche market of "pi". It may surprise you to find out that there are only a few thousand people in the world who search for pi shirts each month. That said, some of my products are, indeed, available in both online stores and one brick-and-mortar store in Seattle. The reason this is really hard, though, is not the relationships, but that wholesaling is a hard thing to do. It is hard to produce enough sales to keep manufacturing costs low enough to make enough profit when you are selling them to retailers at half-price (half-off retail is the typical wholesale price). I definitely make the majority of my money by being a retailer, not a wholesaler. Well, hopefully, that provides at least a teeny bit of spark to get you going. Good luck!